There are many instances when we notice a substance being separated from a mixture of materials. Tea leaves are separated from the liquid with a strainer, while preparing tea (Fig. 5.1). Grain is separated from stalks, while harvesting. Milk or curd is churned to separate the butter (Fig. 5.2). As we learned in Chapter 3, we gin cotton to separate its seeds from the fibre. Perhaps you might have eaten salted daliya or poha. If you found that it had chillies in it, you may have carefully taken them out before eating. Suppose you are given a basket containing mangoes and guavas and asked to separate them. What would you do? Pick out one kind and place them in a separate container, right? Seems easy, but what if the materials we want to separate are much smaller than mango or guava? Imagine you are given a glass of sand with salt mixed in it. Impossible, even to think of separating salt from this mixture by picking out grains of sand by hand! But, why would we need to separate substances like this at all, is what Paheli wants to know. Table 5.1 Why do we separate substances? What do we do with the separated components? 2) Churning milk to obtain butter b) To remove non-useful components. ii) We throw away the impurities. 3) Separate tea leaves c) To remove impurities or harmful components. iii) We use both the components. process with its purpose and the way separated components are used? We see that, before we use a substance, we need to separate harmful or non-useful substances that may be mixed with it. Sometimes, we separate even useful components if we need to use them separately. The substances to be separated may be particles of different sizes or materials. These may be solids, liquids or even gases. So, how do we separate substances mixed together if they have so many different properties? We will discuss some simple methods of separating substances that are mixed together. You may come across some of these methods being used in day to day activities. Activity 2 Bring a packet of grain purchased from a shop to the classroom. Now, spread the grain on a sheet of paper. Do you find only one kind of grain on the sheet of paper? Are there pieces of stone, husks, broken grain and particles of any other grain in it? Now, remove with your hand the pieces of stone, husks and other grains from it. 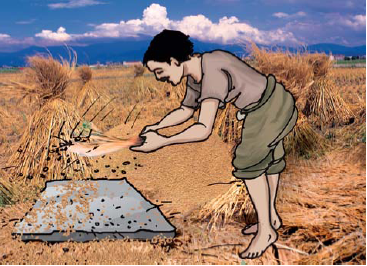 This method of handpicking can be used for separating slightly larger sized impurities like the pieces of dirt, stone, and husk from wheat, rice or pulses (Fig. 5.3). The quantity of such impurities is usually not very large. 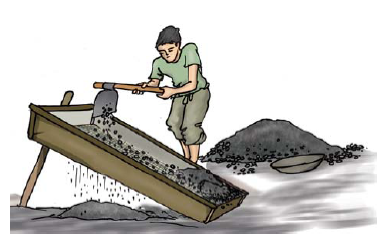 In such situations, we find that handpicking is a convenient method of separating substances. You must have seen bundles of wheat or paddy stalks lying in fields after harvesting the crop. Stalks are dried in the sun before the grain is separated from them. Each stalk has many grain seeds attached to it. Imagine the number of grain seeds in hundreds of bundles of stalk lying in the field! How does the farmer separate grain seeds from those bundles of stalks? One may pluck mangoes or guavas from the trees. But, grain seeds are much smaller than mangoes or guavas. So, plucking them from their stalks would be impossible. How does one separate grain seeds from their stalks? The process that is used to separate grain from stalks is threshing. In this process, the stalks are beaten to free the grain seeds (Fig. 5.4). Sometimes, threshing is done with the help of bullocks. Machines are also used to thresh large quantities of grain. Activity 3 Make a mixture of dry sand with sawdust or powdered dry leaves. Keep this mixture on a plate or a newspaper. Look at this mixture carefully. Can the two different components be made out easily? Are the sizes of particles of the two components similar? Would it be possible to separate the components by handpicking? Now, take your mixture to an open ground and stand on a raised platform. Put the mixture in a plate or sheet of paper. 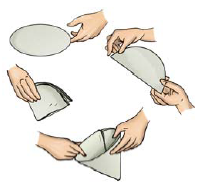 Hold the plate or the sheet of paper containing the mixture, at your shoulder height. Tilt it slightly, so that the mixture slides out slowly. What happens? 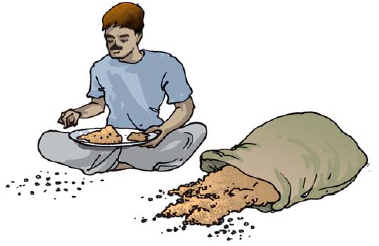 Do both the components — sand and sawdust (or powdered leaves) fall at the same place? Is there a component that blows away? Did the wind manage to separate the two components?. This method of separating components of a mixture is called winnowing. Winnowing is used to separate heavier and lighter components of a mixture by wind or by blowing air. 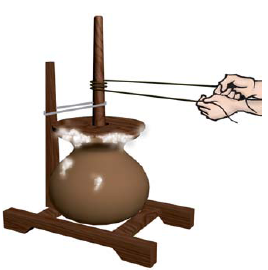 This method is commonly used by farmers to separate lighter husk particles from heavier seeds of grain (Fig. 5.5). The husk particles are carried away by the wind. The seeds of grain get separated and form a heap near the platform for winnowing. The separated husk is used for many purposes such as fodder for cattles. Sometimes, we may wish to prepare a dish with flour. We need to remove impurities and bran that may be present in it. What do we do? We use a sieve and pour the flour into it (Fig. 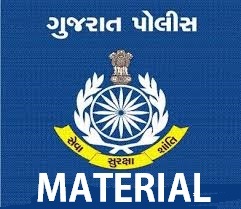 5.6). to separate pebbles and stones from sand (Fig. 5.7). 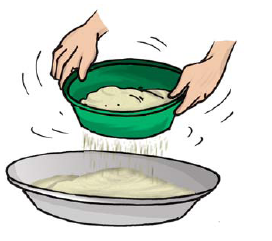 Activity 4 Bring a sieve and a small quantity of flour from home, to the class. Sieve the flour to separate any impurities in it. Now, make a fine powder of chalk pieces and mix it with the flour. Can we separate the flour and the powdered chalk by sieving? 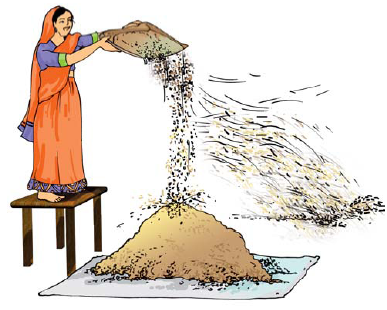 Sieving is used when components of a mixture have different sizes. Sometimes, it may not be possible to separate components of a mixture by winnowing and handpicking. For example, there may be lighter impurities like dust or soil particles in rice or pulses. How are such impurities separated from rice or pulses before cooking? 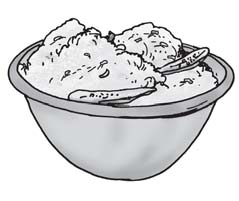 Rice or pulses are usually washed before cooking. When you add water to these, the impurities like dust and soil particles get separated. These impurities go into water, which becomes a little muddy. Now, what will sink to the bottom of the vessel — rice or dust? Why? Have you seen that the vessel is tilted to pour out the dirty water? When the heavier component in a mixture settles after water is added to it, the process is called sedimentation. When the water (along with the dust) is removed, the process is called decantation (Fig. 5.8). Let us find a few other mixtures that can be separated through sedimentation and decantation. The same principle is used for separating a mixture of two liquids that do not mix with each other. 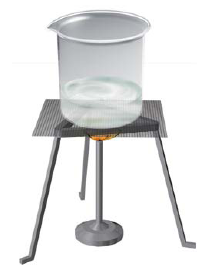 For example, oil and water from their mixture can be separated by this process. If a mixture of such liquids is allowed to stand for some time, they form two separate layers. The component that forms the top layer can then be separated by decantation. Let us again consider a mixure of a solid and liquid. After preparing tea, what do you do to remove the tea leaves? Try decantation. It helps a little. But, do you still get a few leaves in your tea? Now, pour the tea through a strainer. Did all the tea leaves remain in the strainer? This process is called filtration (Fig. 5.1). Which method of separating tea leaves from prepared tea is better, decantation or filtration? Let us now consider the example of water that we use. Do all of us, at all times, get safe water to drink? Sometimes, water supplied through taps may be muddy. The water collected from ponds or rivers may also be muddy, especially after rains. Let us see if we can use some method of separation to remove insoluble impurities like soil from the water. Activity 5 Collect some muddy water from a pond or a river. If it is not available, mix some soil to water in a glass. Let it stand for half an hour. Observe the water carefully and note your observations. Does some soil settle at the bottom of water? Why? What will you call this process? Now, slightly tilt the glass without disturbing the water. Let the water from the top flow into another glass (Fig. 5.8). What will you call this process? Is the water in the second glass still muddy or brown in colour? Now filter it. Did the tea strainer work? Let us try filtering the water through a piece of cloth. In a piece of cloth, small holes or pores remain in between the woven threads. These pores in a cloth can be used as a filter. If the water is still muddy, impurities can be separated by a filter that has even smaller pores. A filter paper is one such filter that has very fine pores in it. Fig. 5.9 shows the steps involved in using a filter paper. A filter paper folded in the form of a cone is fixed onto a funnel (Fig. 5.10). The mixture is then poured on the filter paper. Solid particles in the mixture do not pass through it and remain on the filter. Fruit and vegetable juices are usually filtered before drinking to separate the seeds and solid particles of pulp. The method of filtration is also used in the process of preparing cottage cheese (paneer) in our homes. You might have seen that for making paneer, a few drops of lemon juice are added to milk as it boils. This gives a mixture of particles of solid paneer and a liquid. The paneer is then separated by filtering the mixture through a fine cloth or a strainer. and disappear completely? Now, add two spoons of salt to water in another beaker and stir it well. Do you see any change in the colour of water? Can you see any salt in the beaker, after stirring? Heat the beaker containing the salt water (Fig. 5.11). Let the water boil away. What is left in the beaker? In this activity, we used the process of evaporation, to separate a mixture of water and salt. Where do you think, salt comes from? Sea water contains many salts mixed in it. One of these salts is the common salt. When sea water is allowed to stand in shallow pits, water gets heated by sunlight and slowly turns into water vapour, through evaporation. In a few days, the water evaporates completely leaving behind the solid salts (Fig. 5.12). Common salt is then obtained from this mixture of salts by further purification. We have studied some methods for separation of substances from their mixtures. Often, one method is not sufficient to separate the different substances present in a mixture. In such a situation, we need to use more than one of these methods. Activity 7 Take a mixture of sand and salt. How will we separate these? We already saw that handpicking would not be a practical method for separating these. Keep this mixture in a beaker and add some water to this. Leave the beaker aside for some time. Do you see the sand settling down at the bottom? The sand can be separated by decantation or filtration. What does the decanted liquid contain? Do you think this water contains the salt which was there in the mixture at the beginning? Now, we need to separate salt and water from the decanted liquid. Transfer this liquid to a kettle and close its lid. Heat the kettle for some time. Do you notice steam coming out from the spout of the kettle? Take a metal plate with some ice on it. 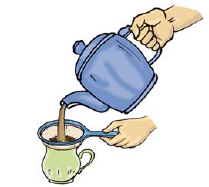 Hold the plate just above the spout of the kettle as shown in Fig. 5.13. What do you observe? Let all the water in the kettle boil off. When the steam comes in contact with the metal plate cooled with ice, it condenses and forms liquid water. The water drops that you observed falling from the plate, were due to condensation of steam. The process of conversion of water vapour into its liquid form is called condensation. 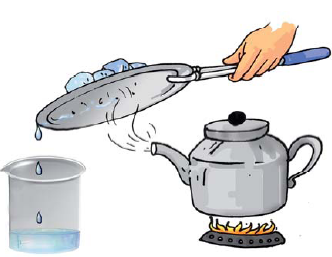 Did you ever see water drops condensed under a plate that has been used to cover a vessel containing milk that has just been boiled? After all the water has evaporated, what is left behind in the kettle? We have thus, separated salt, sand and water using processes of decantation, filtration, evaporation and condensation. amount of sand. She then tried the method suggested in Activity 7, to recover the salt. She found, however, that she could recover only a small part of the salt that she had taken. What could have gone wrong? Can water dissolve any amount of a substance? In chapter 4, we found that many substances dissolve in water and form a solution. We say that these substances are soluble in water. What will happen if we go on adding more and more of these substances to a fixed quantity of water? Activity 8 You will need a beaker or a small pan, a spoon, salt and water. Pour half a cup of water in the beaker. Add one teaspoonful of salt and stir it well, until the salt dissolves completely (Fig 5.14). Again add a teaspoonful of salt and stir well. Go on adding salt, one teaspoonful at a time, and stir. 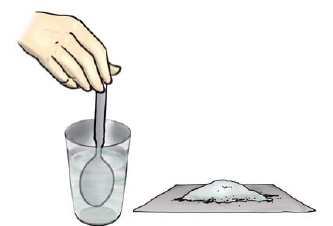 After adding a few spoons of salt, do you find that some salt remains undissolved and settles at the bottom of the beaker? If yes, this means that no more salt can be dissolved in the amount of water we have taken. The solution is now said to be saturated. 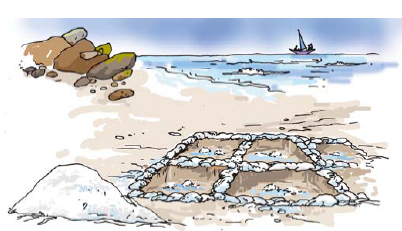 would have remained mixed with the sand and could not be recovered. She could solve her problem by using a larger quantity of water. Suppose, she did not have sufficient quantity of water to dissolve all the salt in the mixture. Is there some way that water could be made to dissolve more salt before the solution gets saturated? Let us try and help Paheli out. Activity 9 Take some water in a beaker and mix salt in it until it cannot dissolve any more salt. This will give you a saturated solution of salt in water. Now, add a small quantity of salt to this saturated solution and heat it. What do you find? 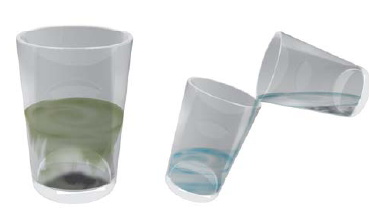 What happens to the undissolved salt in the bottom of the beaker? Does it dissolve, now? If yes, can some more salt be dissolved in this solution by heating it? Let this hot solution cool. Does the salt appear to settle at the bottom of the beaker again? The activity suggest that larger quantity of salt can be dissolved in water on heating. Does water dissolve equal amounts of different soluble substances? Let us find out. Activity 10 Take two glasses and pour half a cup of water in each of them. Add a teaspoon of salt to one glass and stir till the salt dissolves. Go on adding salt, one teaspoon at a time, till the solution saturates. Record the number of spoons of salt that dissolved in the water, in Table 5.2. Now, repeat the same activity with sugar. Repeat this with some other substances that are soluble in water. What do you notice from Table 5.2? Do you find that water dissolves different substances in different amounts? We have discussed a few methods of separating substances. Some of the methods of separation presented in this chapter are also used in a science laboratory. We also learnt that a solution is prepared by dissolving a substance in a liquid. A solution is said to be saturated if it cannot dissolve more of the substance in it. Handpicking, winnowing, sieving, sedimentation, decantation and filtration are some of the methods of separating substances from their mixtures. Husk and stones could be separated from grains by handpicking. Husk is separated from heavier seeds of grain by winnowing. Difference in the size of particles in a mixture is utilised to separate them by the process of sieving and filtration. In a mixture of sand and water, the heavier sand particles settle down at the bottom and the water can be separated by decantation. Filtration can be used to separate components of a mixture of an insoluble solid and a liquid. Evaporation is the process in which a liquid gets converted into its vapour. 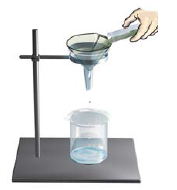 Evaporation can be used to separate a solid dissolved in a liquid. A saturated solution is one in which no more of that substance can be dissolved. Water dissolves different amount of soluble substances in it.